It is my husband’s birthday tomorrow. 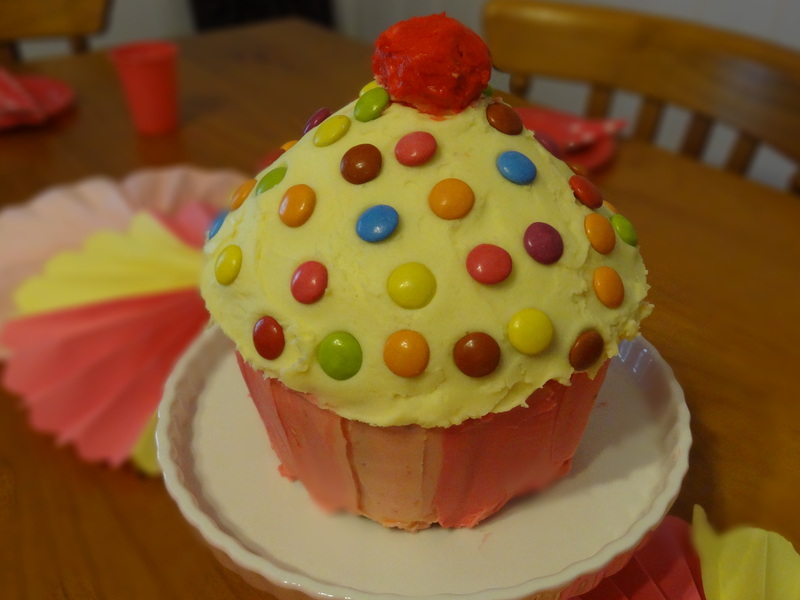 Master O has spent the last week excited at the prospect of being responsible for making his father’s cake. 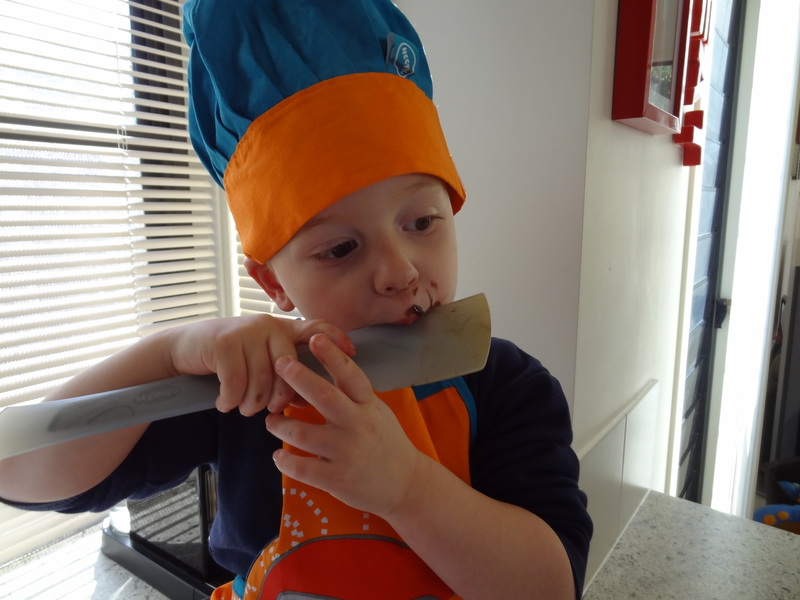 He wanted it to be just like the events in his favourite book to read at Kindermusik class, Spot Bakes a Cake. 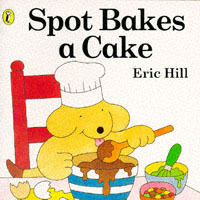 In the book, Spot and his Mum shop for ingredients, bake and then decorate a cake for Spot’s Dad’s birthday. 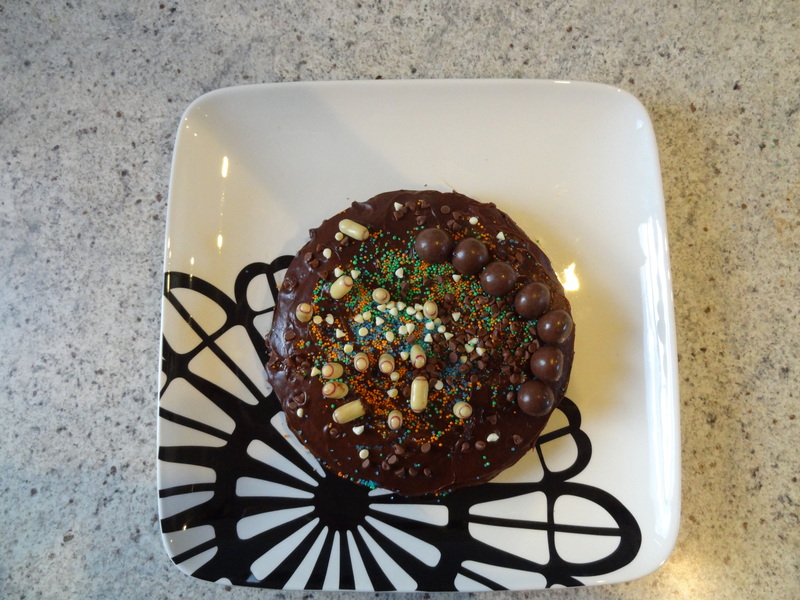 Not wanting to spend yet another day restraining his enthusiasm, I decided to make the cake today. 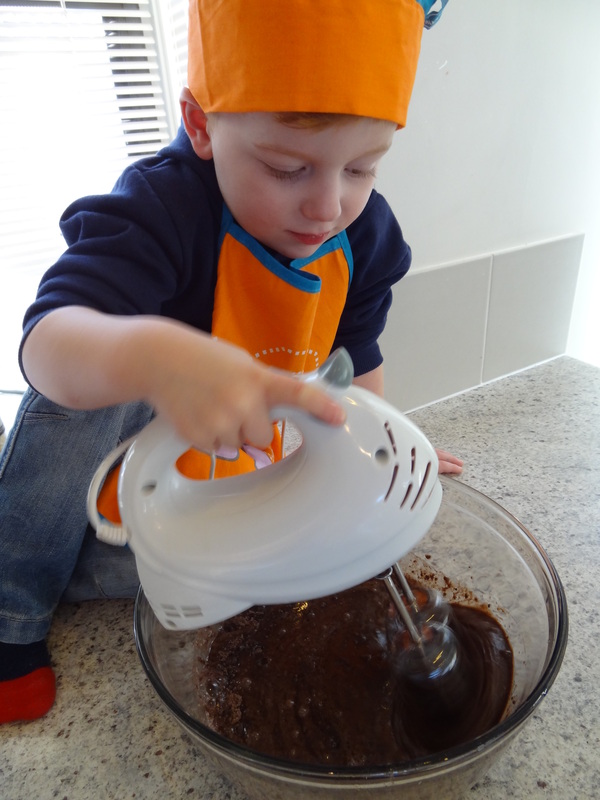 The mixing and baking bit was fun, but what Master O really wanted to do was to decorate the cake. I promised him that it would be entirely his responsibility. That was a HUGE step for me. I am a bit of a perfectionist when it comes to such things. However, taking a back seat to an over-enthusiastic, symmetry ignoring, messy and heavy-handed 3-year-old boy was character building. 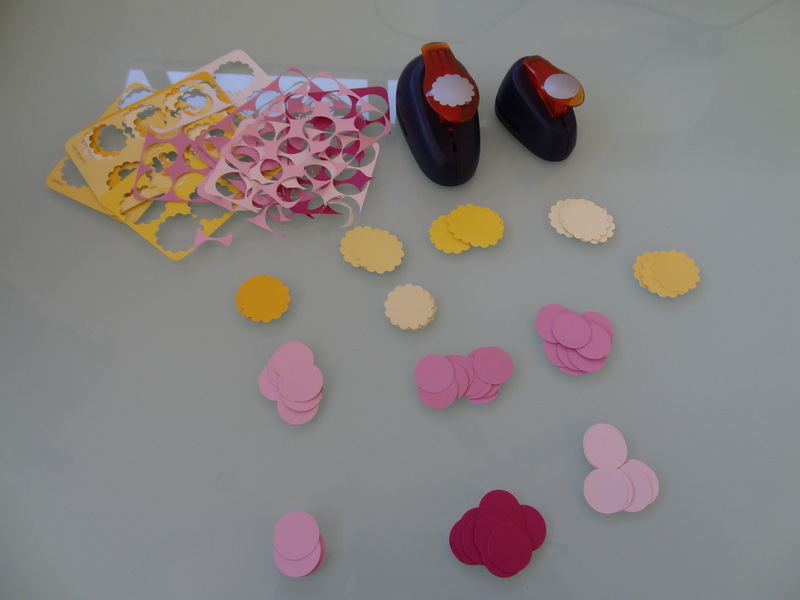 Admittedly, I did help Master O’s creative process by making the decorations easier to apply and handle. Like most kids, he loves sprinkles. Most of the time they come in sachet and they are a nightmare to apply neatly. I recommend throwing these into a cheap shaker that you can pick up just about anywhere these days. 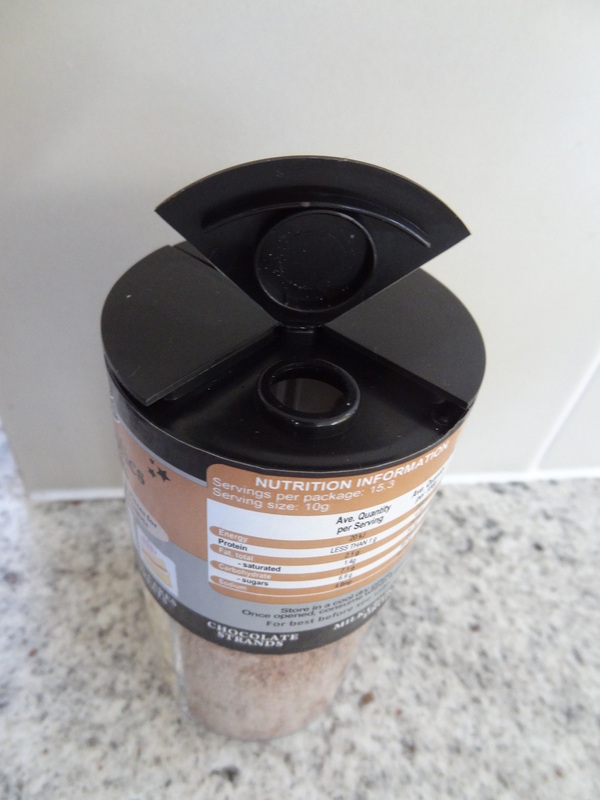 Or for an even cheaper alternative, keep your shaker bottles that your herbs come in for this purpose. 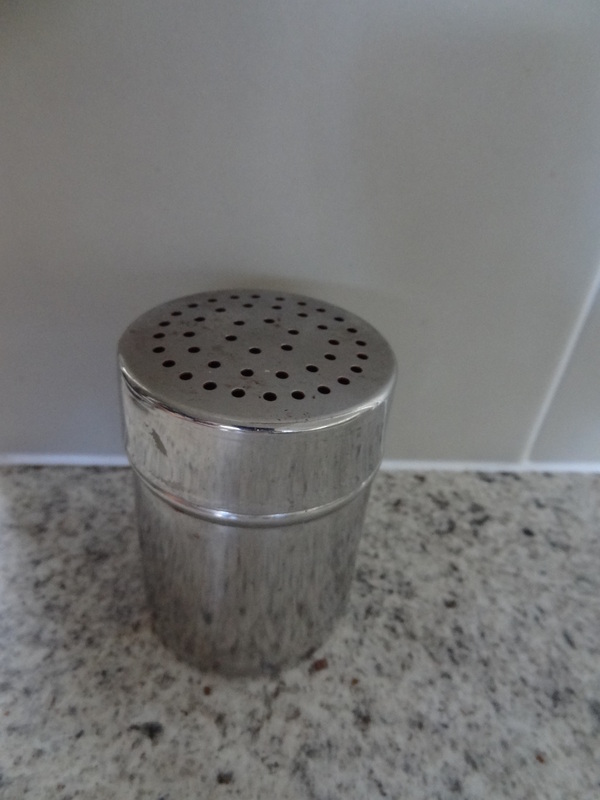 Just make sure that the holes at the top are big enough to dispense your chosen sprinkle. 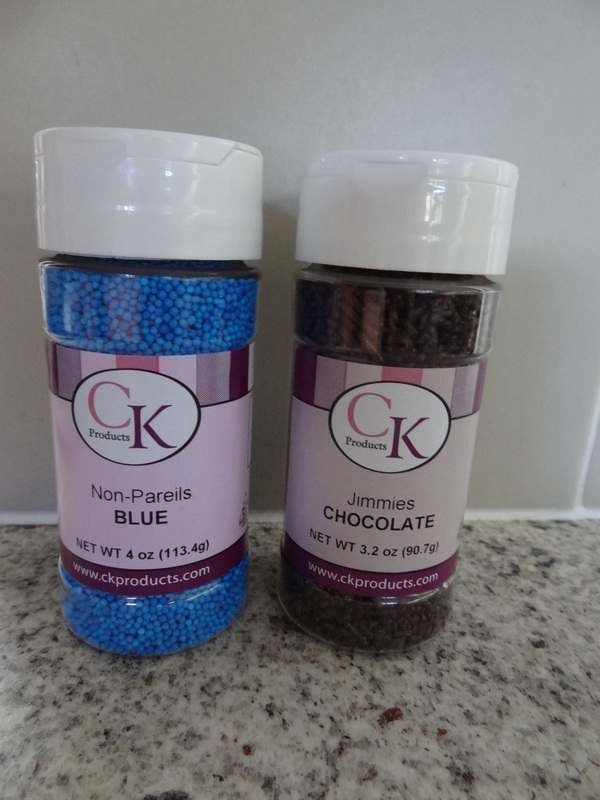 If you time things right, when Spotlight or cake decorating shops have a sale, pop in and pick up some sprinkles then. Not only have they have great selections you would never find in your local supermarket, they come in shaker bottles. Once done, keep them and refill. 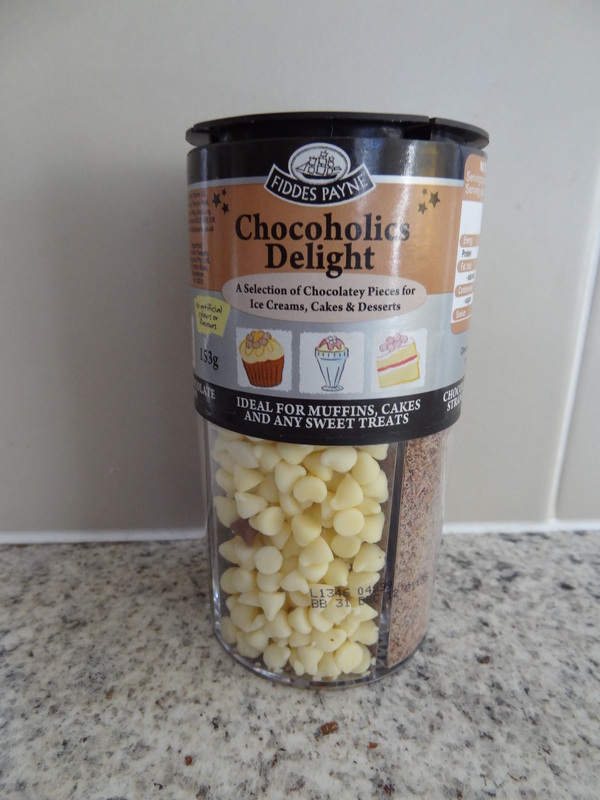 A great help today was this nifty chocolate decoration dispenser my MIL picked up from Aldi. 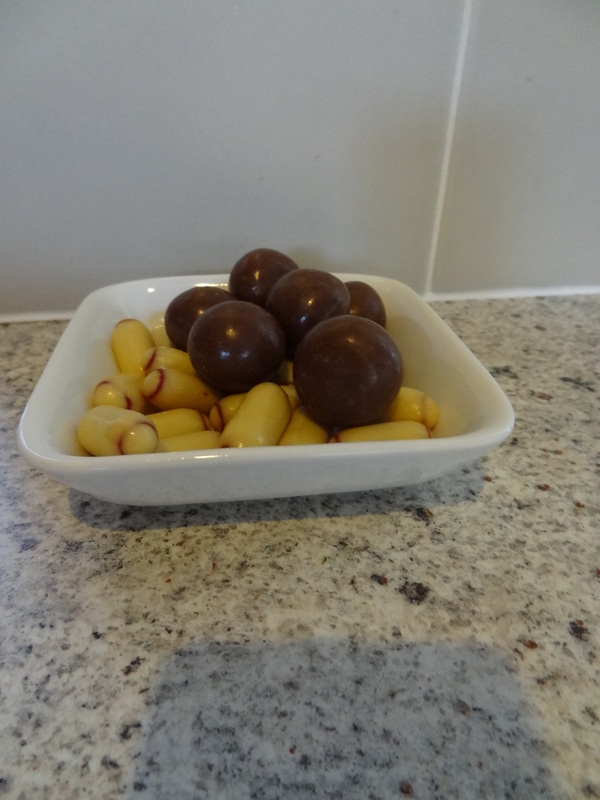 It came packed with jimmies, choc shards and chocolate buttons. It has a bigger opening so it is great for those bigger toppings. I will certainly be holding on to this when we use up the contents. 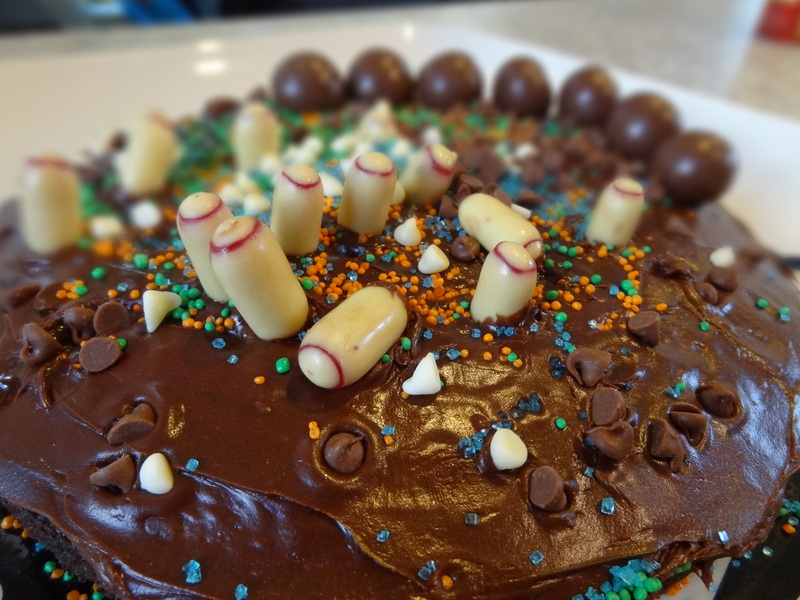 When it comes to sprinkles, whatever your method of application, I recommend limiting the amount you give the kids to what you are happy to have applied to your cake. Those things are slippery suckers and a light dusting can quickly turn into a downpour. 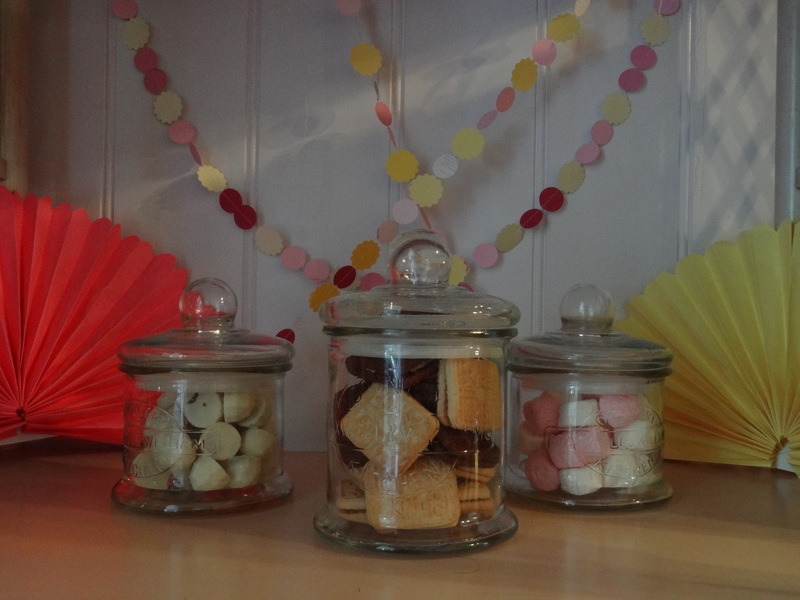 For big decorations like lollies/candy, lay them out on a plate or in bowls so little hands can easily grasp them. So Master O went to town with his decorations. I am glad I put the cake on a massive platter as the sprinkles did jump around! I am sure Dad will love his cake. My husband’s Grandmother’s birthday is tomorrow. She always insists fiercely that she doesn’t want anything as a present. Obviously we ignore those requests and often give her framed kid’s photos or drawings which she loves dearly to display in her home. Being sidelined these last couple of weeks with an injured neck has meant that this birthday has snuck up on me. My intention was to get some of Master O’s pictures printed onto tea towels but to do that, I would need time which I just didn’t have. Pulling an idea out of the recesses of my brain, I decided to transfer some of his pictures myself. 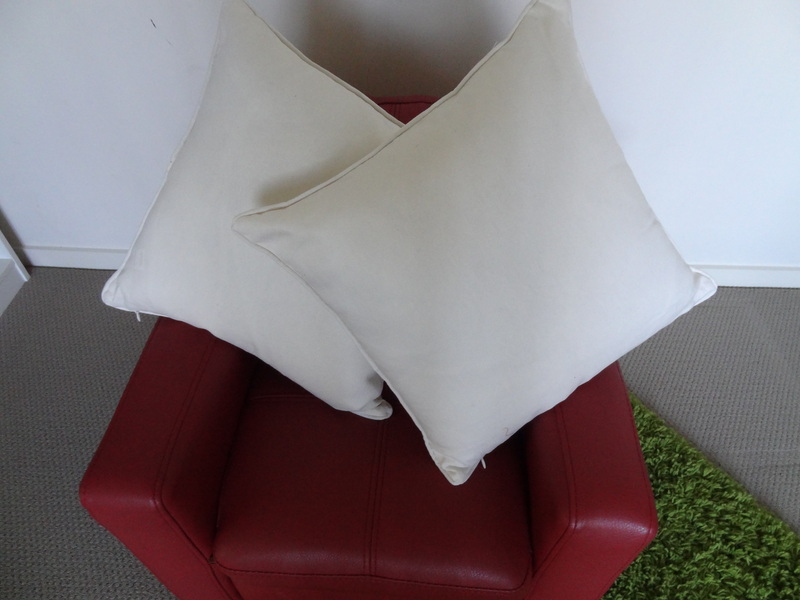 I bought a couple of cream coloured cushions from my local Target and a good laundry pen. 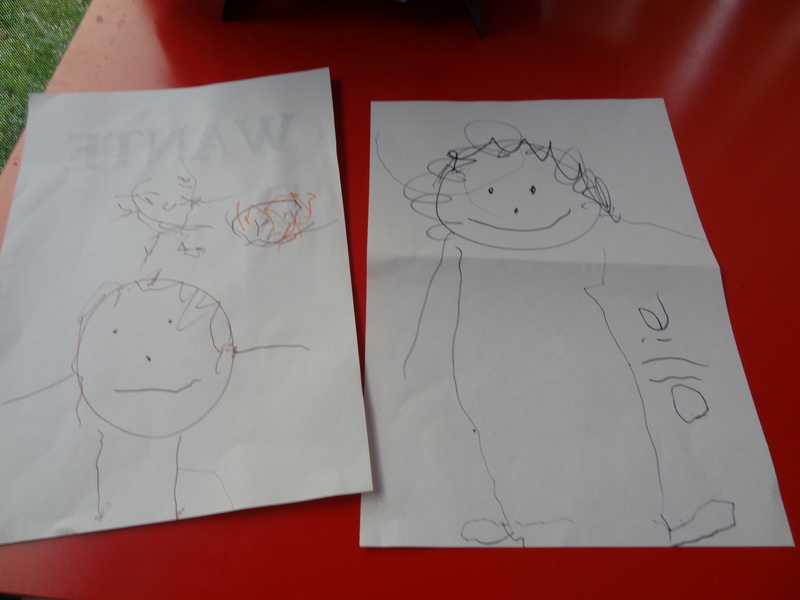 I then got Master O to draw a picture of himself and his Nan and write both of their names. I love how he is yet to recognise his people don’t have bodies! 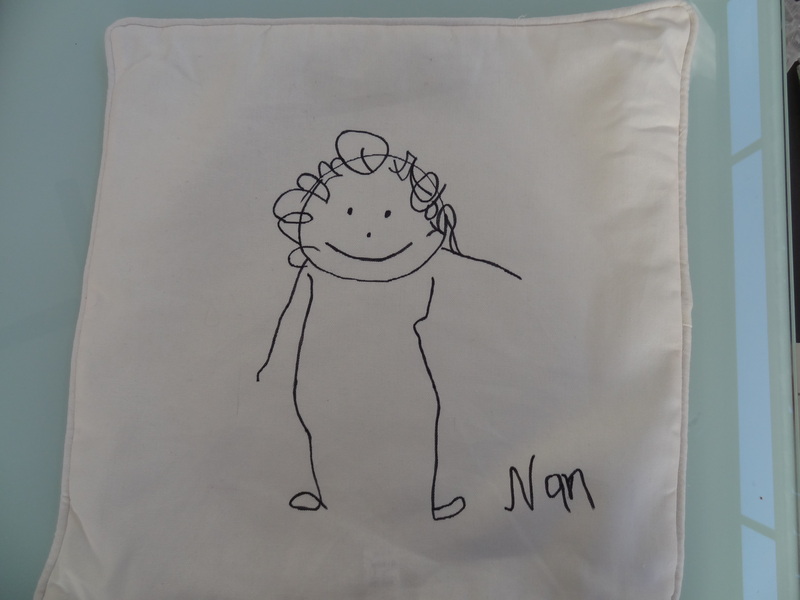 Taking the inserts out of the pillow slip, I put the drawings inside. 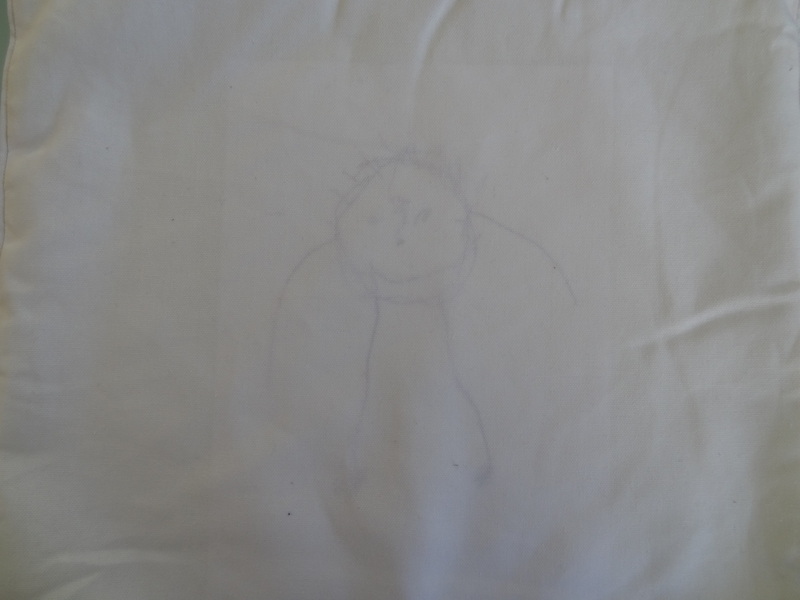 As I had got Master O to draw in a dark coloured felt-tipped pen, the picture was clearly visible through the fabric. 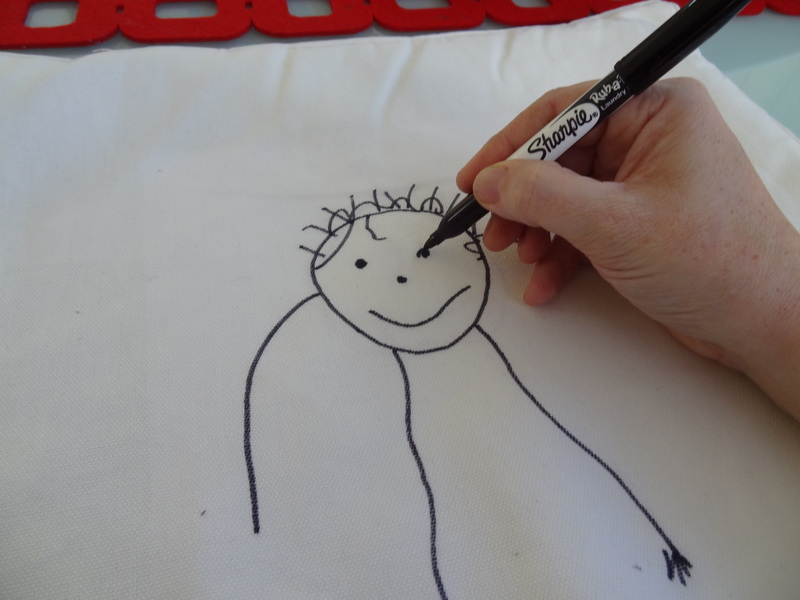 I then got to tracing his pictures in the laundry pen. The laundry pen did a fantastic job – dark, sharp lines. 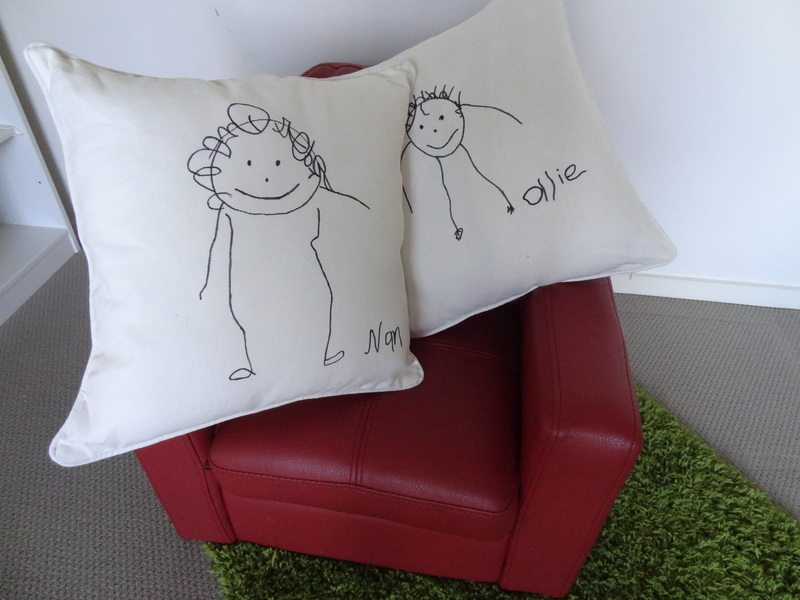 The finished pillows look great and I know Nan will treasure them. I saw a cute DIY table runner featured on Tip Junkie last week from the blog, Green Wedding Shoes. 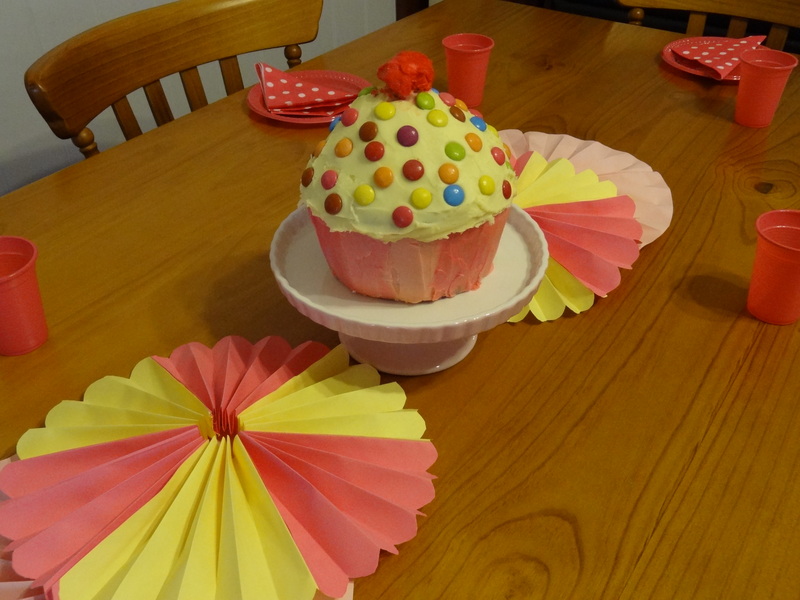 I thought this would be adorable as a table runner for my niece’s afternoon tea birthday party. 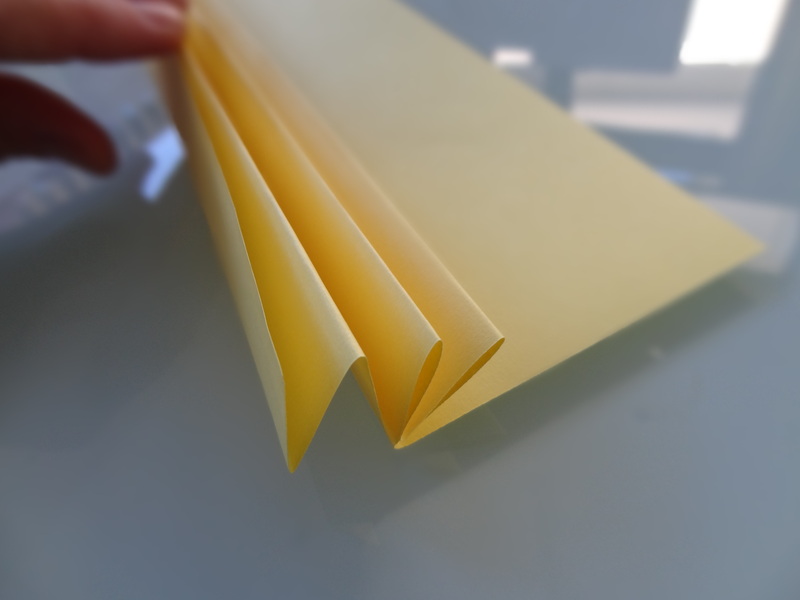 Picking out a few pieces of pink, yellow and blue paper in various sizes to match the paint chip garland I made the other day, I got a folding. 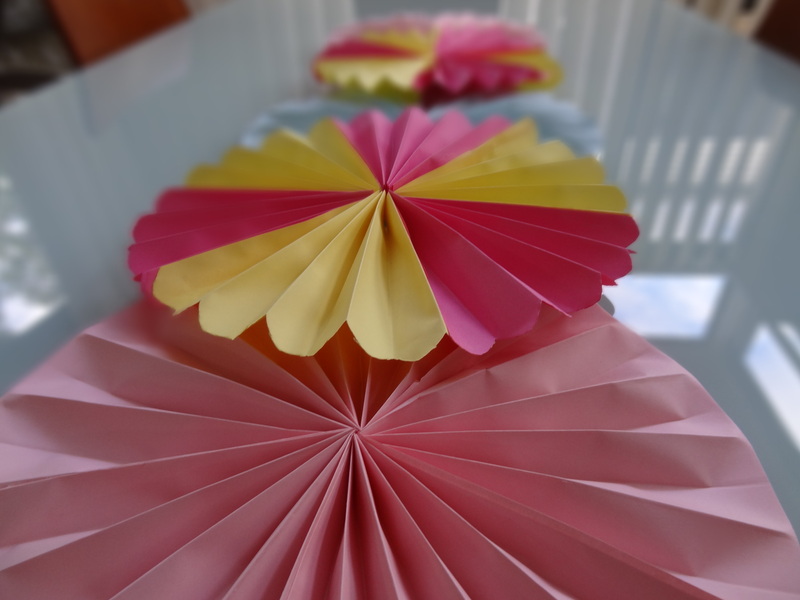 I followed Jen’s easy tutorial, although I found that I needed more paper than she suggested to make a full pinwheel. 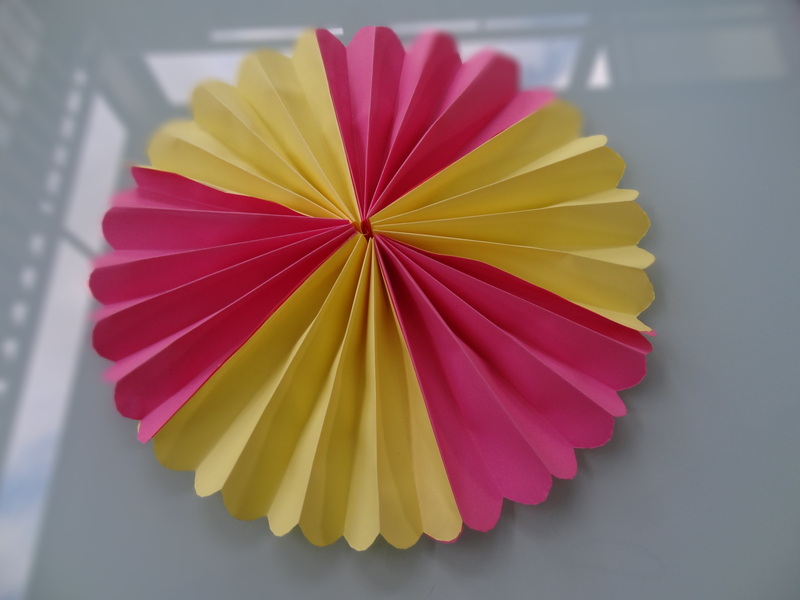 All in all I made five pinwheels, two of which I used alternating colours in. 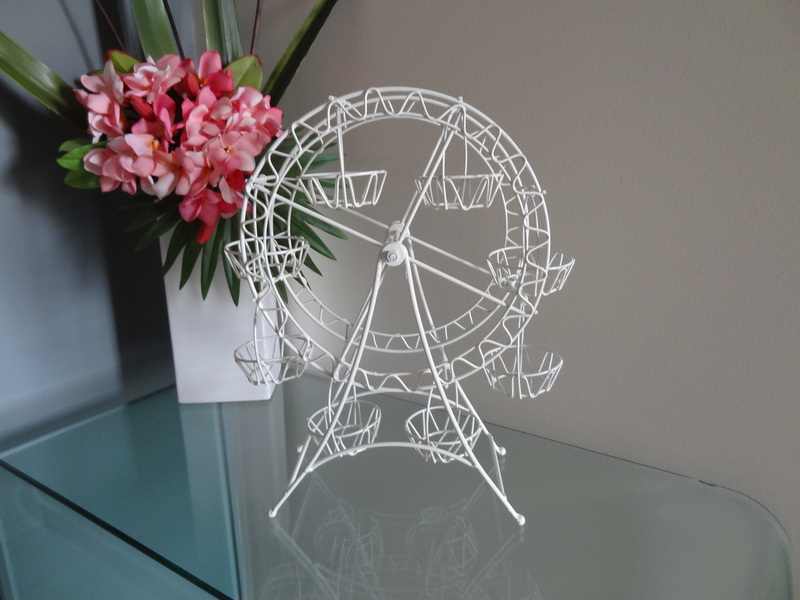 After having a little bit of a play with them on my table, I really like them as a decorating idea. I think these would look cute at a whole host of occasions. 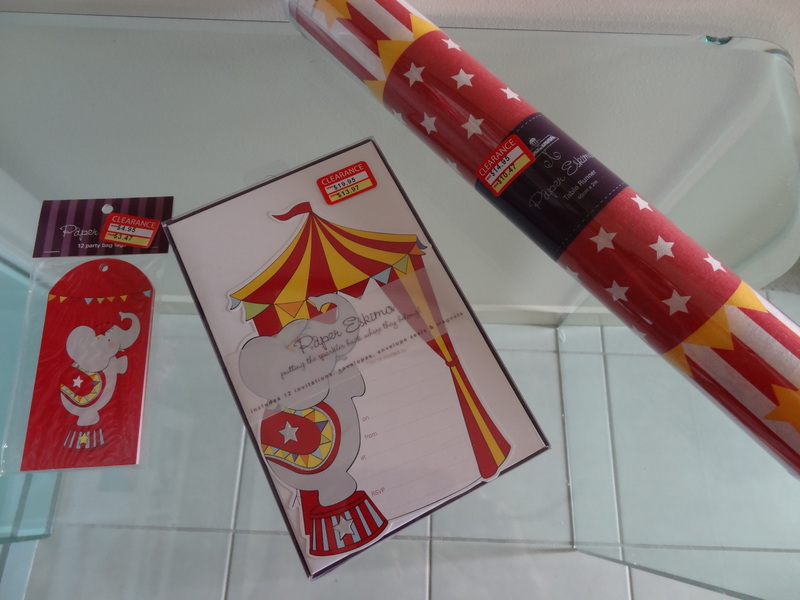 It would look gorgeous in patterned and textured papers for a more adult affair. 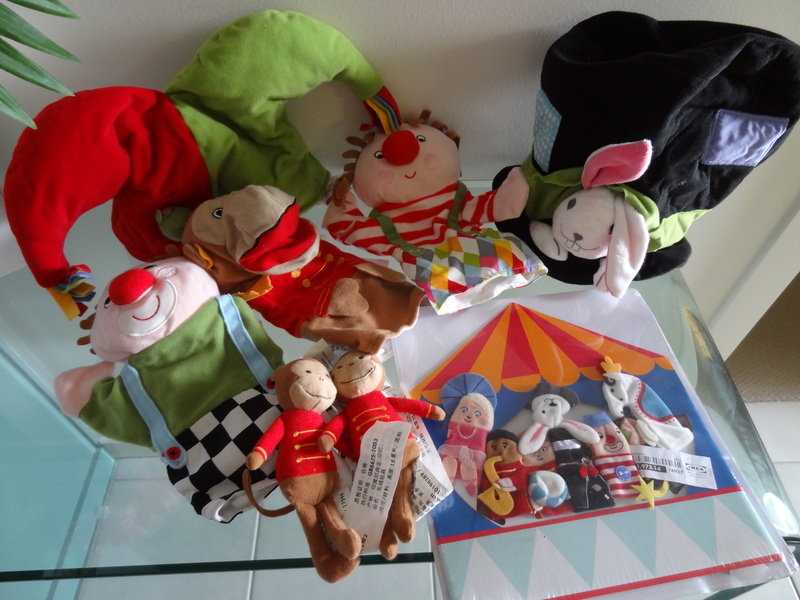 Tune back in a few days to see it laid out for my niece’s birthday celebration. 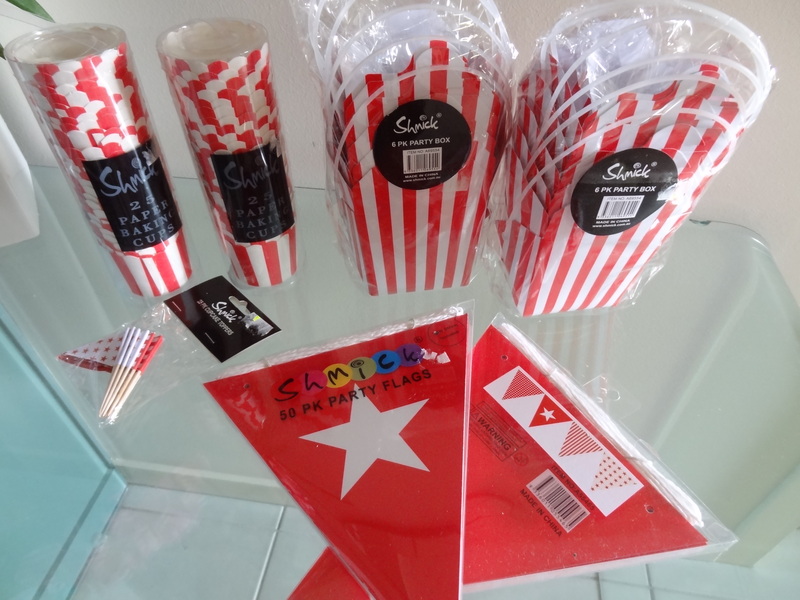 I have had some paint chips lying around in anticipation of a fun craft project. My cute niece turns five next week so I thought her birthday was the perfect event to get crafting for. For her present, I have already created some fabric yo-yo clothes for the cooler weather here in Australia. You can read about these here and here. 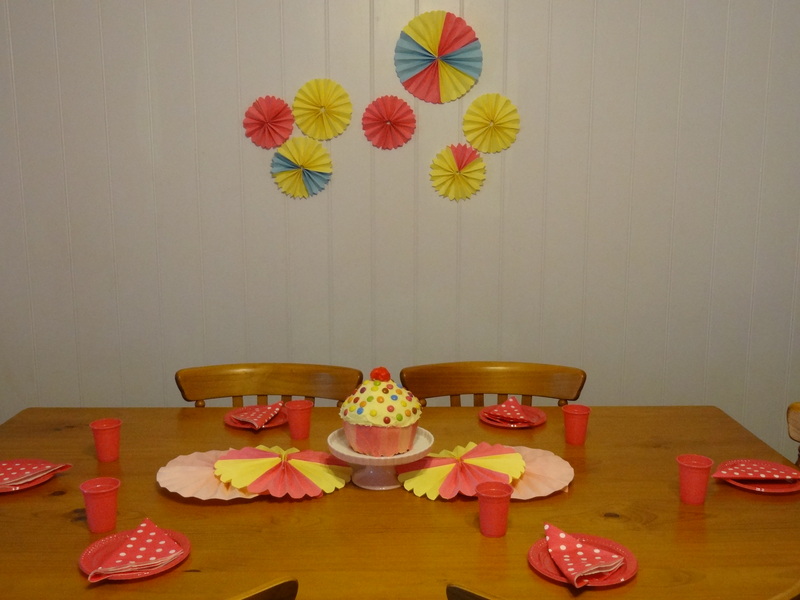 For the party, I thought the paint chips could be used to make a garland to hang behind her cake table. 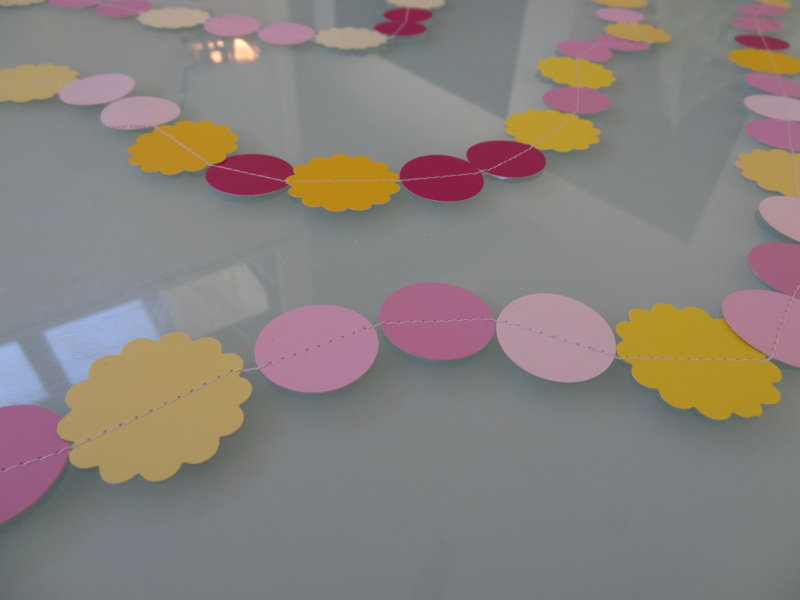 Picking out the pink and yellow paint chips, I used my Friskars craft punches to cut out plain and scalloped edged circles. 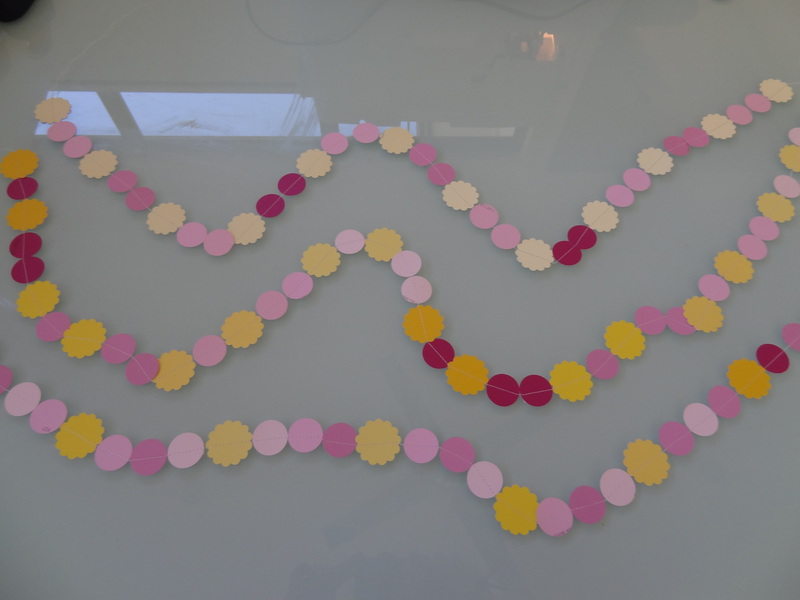 I roughly worked out a pattern for the paint chip colours and ensured I had enough for the length of garland I needed. 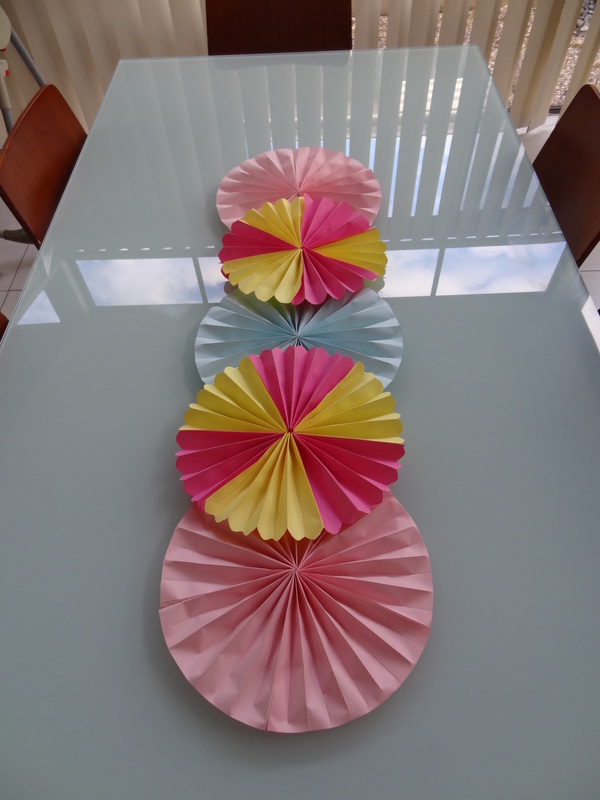 For this party I chose to make three smaller garlands in differing patterns. 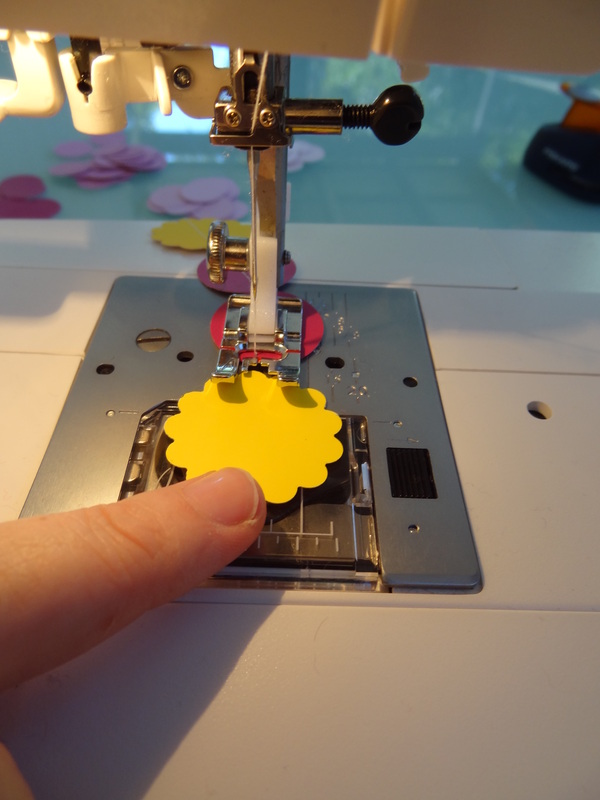 Using standard cotton threaded in my machine, and selecting a plain stitch, I lined up the paint chips and got sewing. I made sure that there was adequate length of cotton at each end of the garland so I could hang it. 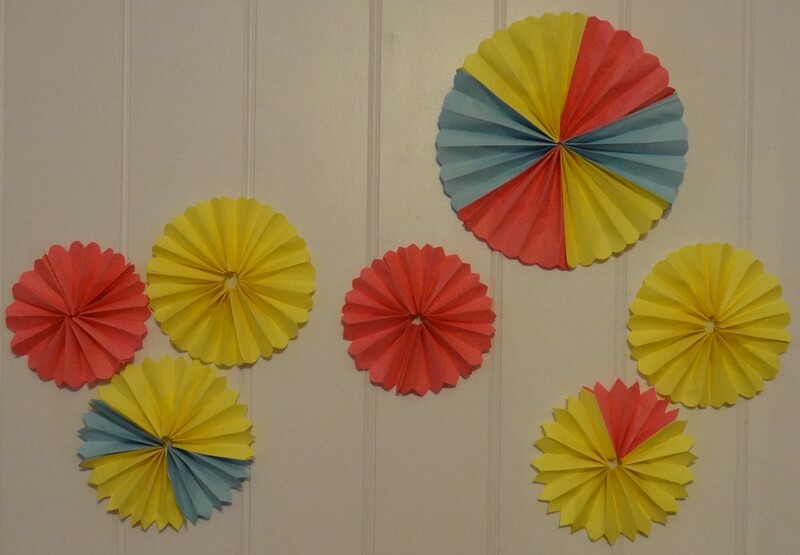 As I am hanging this garland against a wall, there was no need for the garland to be double-sided. I could have sewn two chips back-to-back if I wanted to have two presentation sides. 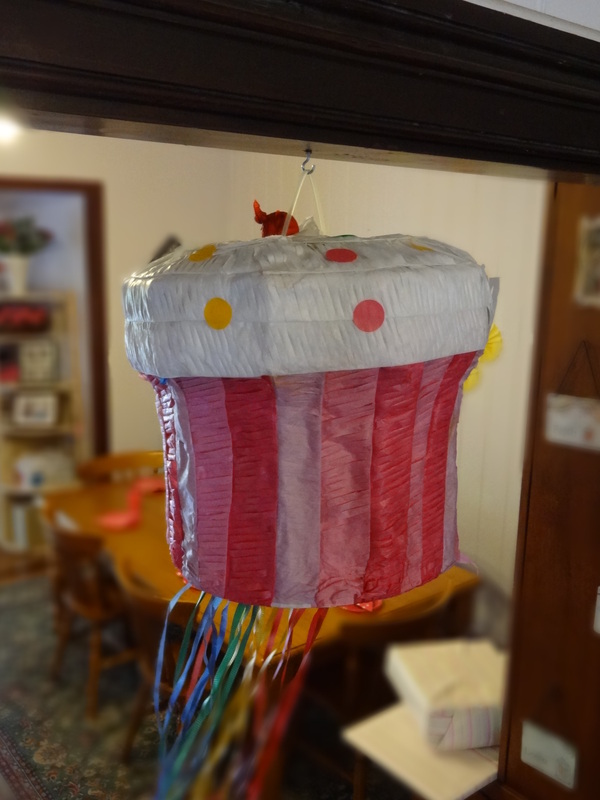 If you don’t have a sewing machine, don’t fret, you could always do this project using craft glue and ribbon. 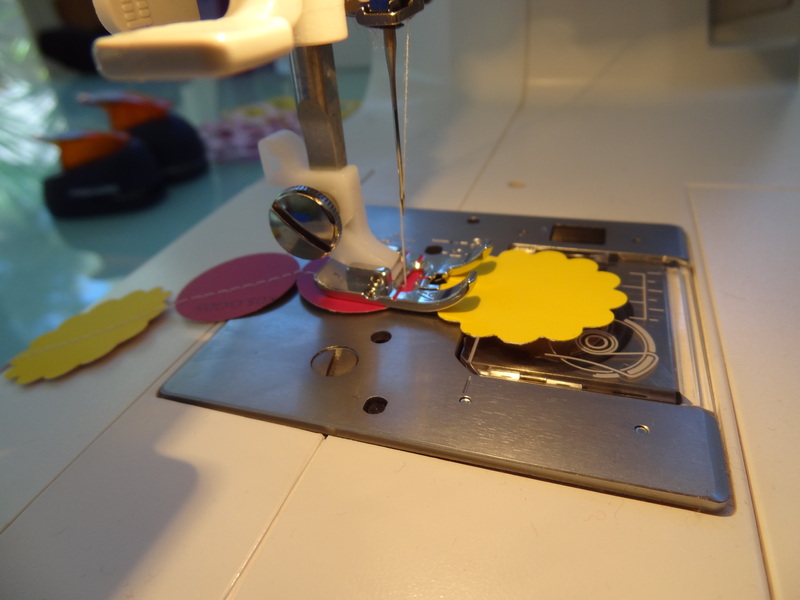 Check back with me during the next week to see what other birthday projects I have on the go.